One of the challenges for an illegal torrent site has to do with the physical manifestations of hosting immaterial files on physical servers in actual places. Two years ago, Forbes was reporting about how the Pirate Parties International wanted to host peer-to-peer sites using weather balloons, or other airborne devices, to get around laws and restrictions on file sharing. As recently as March of this year, it was being reported that The Pirate Bay was considering using low flying GPS controlled drones to use for their servers. The Pirate Bay said that “With the development of GPS controlled drones, far-reaching cheap radio equipment and tiny new computers like the Raspberry Pi, we’re going to experiment with sending out some small drones that will float some kilometers up in the air. This way our machines will have to be shut down with aeroplanes in order to shut down the system. A real act of war”. In reality the Pirate Bay has been shedding its materiality to protect itself from the legal troubles imposed by the state on behalf of the entertainment industry that have plagued the Pirate Bay. Rather than moving to GPS controlled drones, the Pirate Bay has moved its servers into the cloud. What this means is that the servers and infrastructure is spread across many virtual machines in different countries. On their blog the Pirate Bay writes that, “Our data flows around in thousands of clouds, in deeply encrypted forms, ready to be used when necessary. Earth bound nodes that transform the data are as deeply encrypted and reboot into a deadlock if not used for 8 hours All attempts to attack The Pirate Bay from now on is an attack on everything and nothing. The site that you're at will still be here, for as long as we want it to. Only in a higher form of being. A reality to us. A ghost to those who wish to harm us”. This move redefines the physical manifestations of the providing a download service and disperses the territory in which the state can impose law upon the Pirate Bay. Though it is unlikely that the Pirate Bay’s confidence is impervious to legal action: the virtual machines are still run by ISPs who are susceptible to legal pressure. Still, the strategy implemented by the Pirate Bay echoes the actions of many other “pirate organizations” that seek to alter state-promoted industry norms while operating from outside state-controlled territory. Seventeenth-century sea pirates found shelter in remote islands not claimed yet by any sovereign. Pirate radio stations used offshore platforms located in international waters to broadcast their programs while avoiding state oversight. 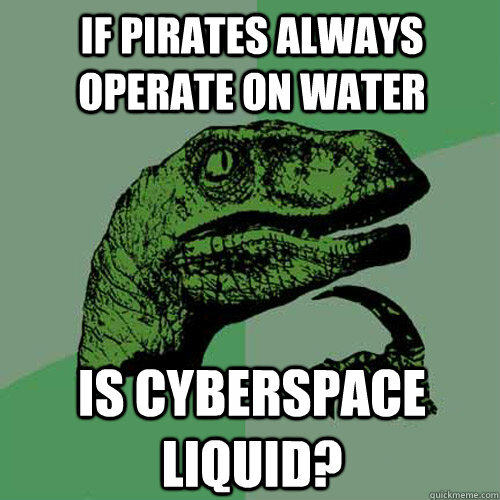 In that sense, cyberspace is no different: as a partially uncharted territory, it still contains areas where the sovereign norm does not apply, thereby providing temporary shelter to the pirates of today. 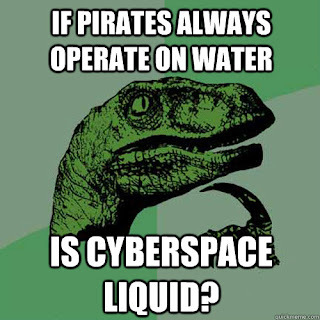 So the question is: Do we want to eradicate all pirate shelters in cyberspace when clearly that would imply granting the state a monopolistic control over that territory?